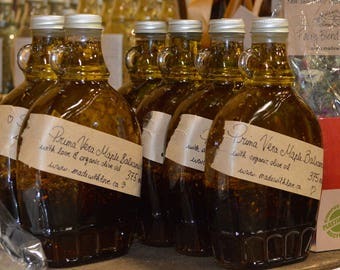 Maple Balsamics, Vinaigrettes and Marinades. 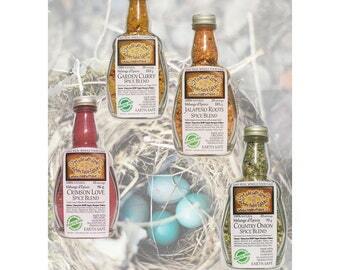 Real Organic Salad Dressing or Marinade made with Extra Virgin Organic Olive Oil, Artisan Spice Blends, Premium Organic Vinegars and Real Maple Syrup when a little sweetness is needed. 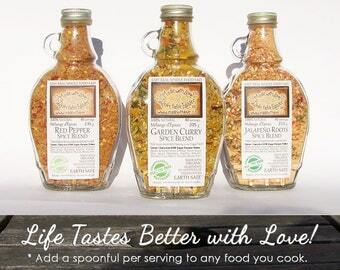 Use any flavour as an Organic Salad Dressing, Italian Bread Dip or Marinade for your meat veggies or fish. Deliciously Real - Taste the quality in every bite! Simple Artisan Flavour. Assorted shapes of 375mL / 12 oz glass bottles sealed with small farm beeswax. 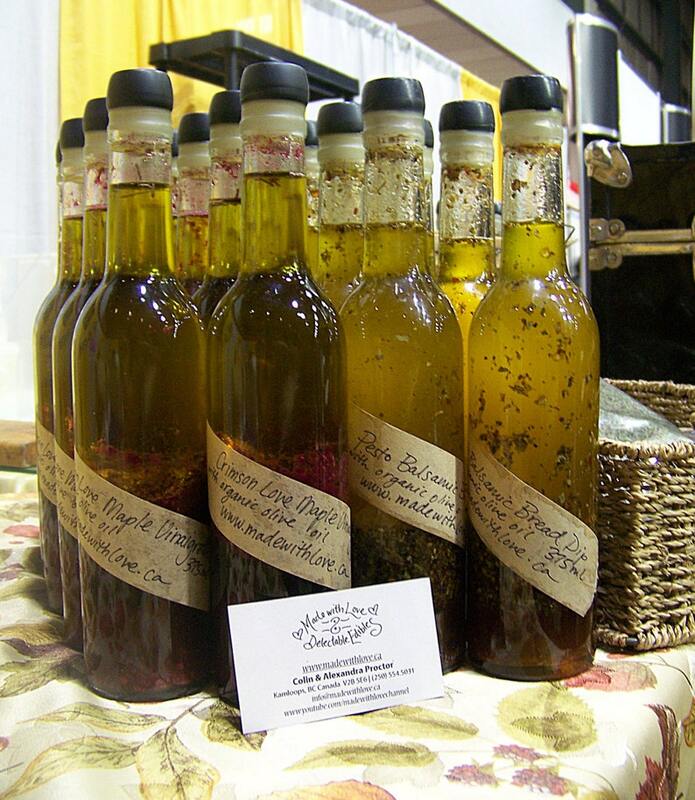 NEW* Daring Dill Maple Balsamic is a rich flavour profile with fresh dill, sun dried tomato and a mustard finish. 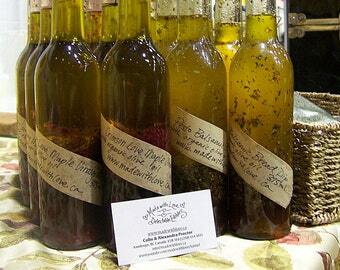 Beautiful vinaigrette salad dressing, as a bread dip or marinade. Ingredients: Extra Virgin Organic Olive Oil, Organic Balsamic Vinegar, Real Canadian Maple Syrup, Daring Dill Artisan Spice Blend (dill, tomato,,mustard, green onion, chives, parsley, raw turbinado sugar, cracked black pepper, sea salt). 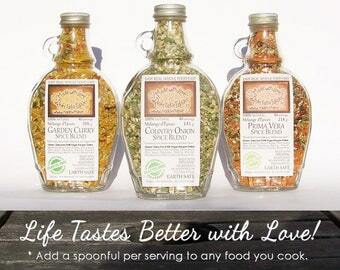 Prima Vera Maple Balsamic is a rich sun dried tomato and Italian herb salad dressing, bread dip or marinade. Ingredients: Extra Virgin Organic Olive Oil, Organic Balsamic Vinegar, Real Canadian Maple Syrup, Prima Vera Artisan Spice Blend (dried tomato, sweet peppers, garlic, onion, summer savory, oregano, basil, parsley, cracked black pepper, sea salt). Crimson Love Maple Vinaigrette is a playfully bright, crimson coloured garlic and rosemary vinaigrette salad dressing, bread dip or marinade. Ingredients: Extra Virgin Organic Olive Oil, White Wine Vinegar, Real Canadian Maple Syrup, Crimson Love Artisan Spice Blend (dried beets, carrots, spinach, garlic, rosemary, cayenne, nori). Red Pepper Curry Marinade is a sweet tangy curry marinade, salad dressing or dip. Ingredients: Extra Virgin Organic Olive Oil, Organic Rice Wine Vinegar, Red Pepper and Garden Curry Artisan Spice Blends (carrot, parsley, cabbage, sweet and hot chili pepper, raw turbinado cane juice sugar, garlic, onion, turmeric, cumin, coriander, fenugreek, fennel, sea salt). PLEASE Flip your bottle upside down and SHAKE HARD like a martini for 1 full minute to emulsify your oil and vinegar before you pour. A thumb held over the bottle opening will help you regulate a perfect pour everytime! Thank-you for your conscious spending! Together we are changing our world.